The Hi-Tech world does not stand at a standstill: new technologies are constantly appearing on the radar. Web technologies are not an exception. In 2015 appeared a new generation notion PWA (Progressive Web Application) — a great combination of web and mobile apps. So let’s have a look at PWAs distinctive features, benefits they could bring to a business, and honestly pointed pitfalls. 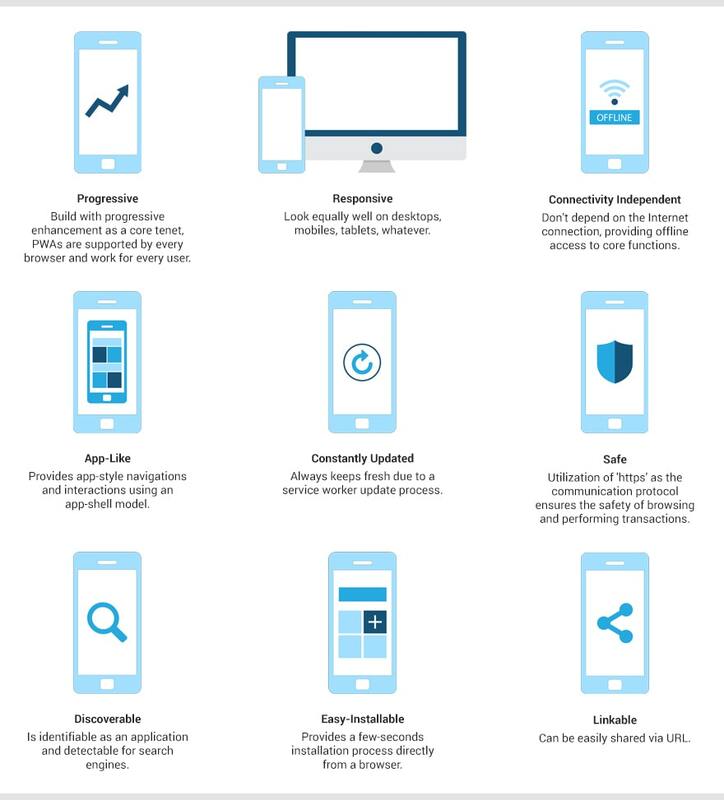 If you are still trying to figure out what is PWA, below is the list of its distinctive features. All the features listed above make PWA a great business solution, so let’s discover what benefits it brings. There are numerous reasons to choose PWA as your business solution. The process of building PWA generally requires less time and effort than the development of a native application. It means that PWA development often leads to cost reduction and shorter production cycle. Even when users just surf the web with no particular purpose, it is possible that they will access your PWA simply by following a link placed anywhere on the web: in a browser, on a website, in a social network. It means you don’t have to compete with millions of apps in the App Store or Google Play. PWA will not annoy new website visitors with a request to install the app. The installation notification will appear for return users only. PWA ensures an instant process of installation achieved by cashing the key components of your website at the very first visit. In comparison to traditional apps, PWAs don’t take much space because they use your website’s source code. Pop-up notifications, offline access, and other functions are available to both new website visitors and those who have already installed the app. Choosing PWA over traditional iOS mobile application means you will not have to pay a 30% sales commission. Although PWAs offer a bunch of benefits, there are some pitfalls as well. First of all, it’s a comparatively new technology, so finding an experienced contractor to build PWA can be a problem. Secondly, PWAs are not supported by Apple, so you will have to exclude iOS-audience. To answer this question, it is important to understand that the main reasons for PWA’s emergence were weaknesses associated with the use of traditional web and mobile applications. They can’t be a part of the web. They are used 4 times rarer than web apps. Their installation requires proceeding from 4 to 6 steps before providing access to the app. They don’t always look good on phones. They are not able to provide offline access. They lose some important features when used on mobiles. Being the golden mean between mobile and native web apps, PWAs solve the above-mentioned problems. So does it make sense for your business to request PWA development? We’ll try to help you with finding the answer. PWAs are already used by world-famous companies such as Uber, Tinder, Pinterest, Forbes, Twitter, AliExpress, Lancome and many others. The future of PWAs is very promising and here are just a few examples of how such apps can enhance your business. With the emergence of PWAs, more and more users each day install these interactive apps. While there is no doubt that PWA can strengthen your business by providing users of your website with a solution that works and looks great on both desktops and mobiles, it is important to understand that the growing number of companies taking advantage of this technology means that you have to hurry up. If your aim is to get as much audience as possible, your ideal moment for making a decision on developing PWA is now. SCAND web development team has been successfully utilizing this top-notch technology for a couple of years. PWAs created by our team include E-Commerce Platform for Automotive Products, Parcel Delivery Service, and Insurance Software. Feel free to contact us with any questions!